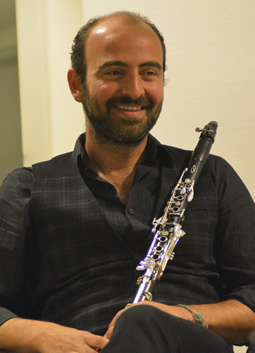 Kinan Azmeh, clarinet, has been described as a “virtuoso” by the New York Times, and “incredibly rich sound” by the CBC. Azmeh is the first Arab to win the first prize at the Nicolay Rubinstein international competition in Moscow (1997). A graduate of the Juilliard School in New York, the High Institute of Music and the Faculty of Electrical Engineering in Damascus, he has recently completed his music doctoral degree at the City University of New York. Kinan has appeared as soloist, composer and improviser worldwide including The Library of Congress, The Kennedy Center, Opera Bastille, Berlin’s Philharmonie, The Mozarteum, Carnegie Hall and the Damascus Opera for its opening concert. He has shared the stage with artists such as Marcel Khalife, Francois Rabbath, Zakir Hussein and Daniel Barenboim.